Now, this sounds MUCH more esoteric than it actually is. It’s really a great concept to keep in mind when mic’ing anything. Sound is vibrations in the air which are picked up by the mics, so that’s what you want the mics to capture (based on your mic’s pickup pattern), and not the instrument itself. Disclaimer: That Q&A doesn’t apply in every situation, but in this case it did help to weed out a few mic positions and save some time. Getting back to the strange method I saw in my short research on this topic, there were two large diaphragm condensers on the player’s right and left, facing each other and pointed down toward the instrument at about a 45 degree angle (spaced pair, maybe?). There was also a third mic in this same position in front of the player. Phasing issues aside, referring back to the second bold point above: unless you have very spaced out ears (we’re talking 3-4 feet) with a third ear extending out from your forehead, chances are that’s not how you would listen to the instrument. You most likely have two ears, which makes it worthwhile to go with a plain and simple stereo mic’ing technique. I set up two AKG C214’s right next to each other, facing out at about 35 degree angles, 8-10 inches directly above* the center note of the Hang. Since the 214’s have a cardioid pickup pattern, this mic position allows for full coverage of the instrument’s nine notes. When panned about half-right and half-left, it gives a very real representation of the Hang through the MOTU 8Pre Interface. *I also saw another picture where someone had one mic out in front of the instrument pointed down at a 45 degree angle, about a foot and half or two feet in front of and above it. The issue with that is the Hang is a circular instrument with notes all around it, so mic’ing it from any one side will produce louder results from the notes closest to the mic, while the notes farthest from it might not pick up as well (think of how the sound waves will spread similar to the Sun’s light and heat affecting planets closer or further away from it). That’s why I figured that a stereo pair right above the center note would be best, and to my relief, it didn’t really need any further processing from there. It had just enough of the “proximity effect” to sound full, articulate, and “beefy” without sounding too bassy or muddy, and the instrument itself is very resonant, so any artificial reverb just clouded it up. When all of the other instruments are added in, I’ll re-examine the Hang tracks for further processing, but for solo purposes, this is the setup I’ll be sticking with – very pleased with the results, and can’t wait to share when the track is complete! I would love to hear your experiences recording the Hang or any other instrument that gave you a challenge! 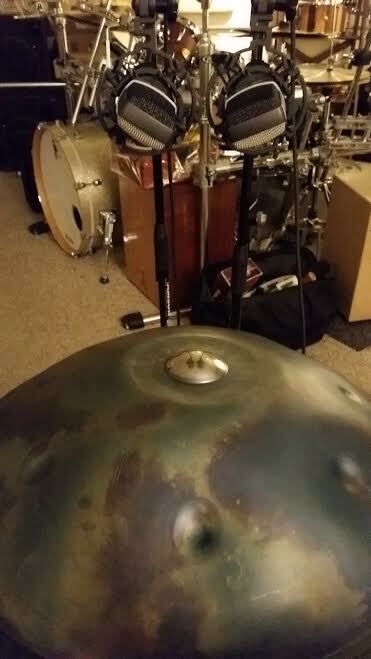 Here’s a little something that I improv’d on the Hang with this mic placement. I enabled free downloading for this track on soundcloud. 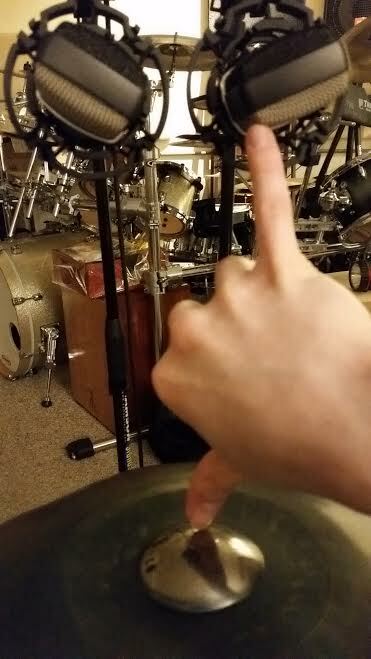 This entry was posted in Blog and tagged audio, hang drum, mixing, music, Percussion, protools, recording, studio. ← The Dark Arts of Percussion, Vol 1: The Wind Gongs of Willow Grove is officially released! Hi mate soundcloud version sounds good! Have you recorded any cds for distribution? Hard at work finishing up an album as we speak! Aiming for an October 2016 release. Keep checking back here, thanks for listening! !